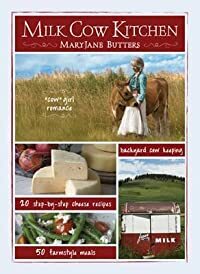 How to buy, keep, and milk a cow with recipes for butter and other FarmGirl favorites MaryJane Butters’ cookbook for all things dairy guides you through 50 fuss-free, farm-style recipes, including 20 stepby-step, super-simple cheese-making recipes, plus how-to details for keeping a pet milk cow on your suburban half acre, a backyard lot in town … or at least the fantasy of a someday cow grazing outside your kitchen window. MaryJane’s concept of “cow”girl romance grabs you at moo. The pioneer of backyard chicken farming and glamping (glamour + camping), MaryJane walks you through the details of how to bring home the latest in fashionable pets, a “cowpanion” that loves and feeds you. The New Yorker said, “… she has a gift for simplification, and makes it seem that everything she does is easy and attainable.” Follow her growing “milk-it-not-twice-but-once-a-day-after-five” miniature milk cow movement at heritagejersey.org. Bringing home her first milk cow in 1979, MaryJane Butters lives in northern Idaho, where she runs her many businesses that include a successful family farm and dairy herd, product lines, stewardship of a historic flour mill, and MaryJanesFarm magazine—now in its 12th year of publication.